Blink, and three years will pass in an instant. I mean, while you know and I know that it’s only actually been three minutes since our gorgeous 14-month-old boys moved into our family, the calendar (damn that thing – is it even a trustworthy article?) suggests it’s actually been nearly three years. Besides wanting to know whether the Google calendar app is capable of speeding up time, I guess I also need to be thinking about applying for some school places. One minute our boys are commando-crawling across the floor – and the next, they’re taking their lives into their hands at every opportunity, causing my heart to skip a beat every time they’re about to jump from something waaaaayyy too high. One minute they’re babbling and cooing – the next, they’re articulately and precisely telling me Every.Single.Detail of something-or-other, the relevance of which I can’t quite work out. Fortunately, the school we chose for our eldest two kids is pastorally brilliant, highly experienced with looked-after children, and goes above-and-beyond to meet the needs of the individuals within its care. The only hesitation in putting it as first choice for our boys will be due to impossible laundry piles or lengthy afternoons making slime (you know how it is with kids and slime. You don’t? Oh, err…forget I said anything) – and not because we’re unsure about the place. I appreciate, though, that the situation isn’t always this easy. 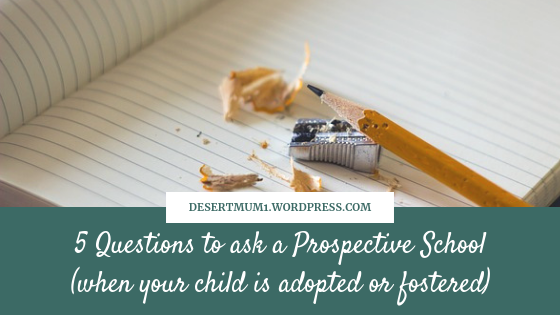 Perhaps it’s your first child who’s preparing to go to school – or perhaps you have older children, but sense that the school they attend will not be the best choice for your adopted or fostered child. In that case, here are five questions which will start a helpful discussion with any prospective schools. They are not exhaustive, nor might you feel it necessary to ask every single one – but they are a start. 1. Who is your designated lead for looked-after children? A new piece of legislation from the government this year requires all maintained schools to have a designated person who keeps an eye on the looked-after children (LAC) within their care (this includes children who are adopted and are no longer under Local Authority care). The likelihood is that this responsibility will fall to someone who is already employed by the school in a pastoral capacity. This, in my opinion, is the ideal. It isn’t really appropriate for a class teacher to have this role, as they’re massively overstretched as it is, and need to be allowed to focus on the children in their class. An exception to this might be if the teacher in question was a member of the senior leadership team, who was given enough time away from their own class to effectively carry out this role. A note here about academies. They are not maintained schools, and therefore are not obliged to follow government directives such as this one. However, any academy worth its weight is likely to want to implement a similar policy. Our school is an academy, and they’ve never played the “We’re not maintained” card to evade responsibility when it comes to raising the aspirations of all their children. So, if you’re looking around an academy, make sure they’ve at least thought this one through! 2. How is your Pupil Premium money spent? Newsflash: all LAC receive Pupil Premium (PP) – this essentially means that the school receives an extra wadge of cash each year to help qualifying children to overcome their disadvantages and have an excellent education. Second newsflash: schools are not required to give this money to you, or to spend it directly on your child! I’ve actually read some threads in online adoption forums which suggest that this is the case! But if you were managing the budget of a small-medium company, and you received additional funding – would you spend it on things which would only last a year? Or things which would last a few years? Or on people who would have a greater long-term impact? I realise that, as parents, a little extra cash towards uniform and equipment would be welcome, but hear me on this one: it will not improve your child’s education. UK parents all receive child benefit – and some of us receive tax credits and/or adoption allowance – which is supposed to go towards these items, so please allow your school to spend its PP on things which will have the greatest educational impact on your child. I’m grateful that our school uses its PP, amongst other things, to pay a full-time pastoral member of staff, to ensure that each class has a teaching assistant (in addition to 1:1 support for kids with SEN), and that regular small group interventions take place for children who are struggling academically. They also make sure they’re up-to-date with training, especially on issues of safeguarding, pastoral care, and attachment. I know that these things will have a big impact on my boys – and other children like them in the school – and am delighted that they’re already in place. One thing to be aware of, though: while schools are entitled to use PP money as they think best, they’re also required to produce data to prove that they’re raising the attainment of the kids who attract this funding. AND, what’s even better, is that they’re required to make this information available on their websites. So even before you look round those schools, make sure you’ve found this information online! It’ll arm you with lots of useful info for when you visit. 3) Have your staff done any training on attachment and/or trauma? With all of these questions, I want to issue a word of caution: no school is perfect. There is so much for teachers to do, so much for school leaders to do, so much for governors to do, that it is literally impossible to focus on all of the things, all of the time. Please don’t write off a school just because their attachment training is out of date (or they haven’t done any). They haven’t been lazy, or uncaring – they’ve likely been getting training in other areas. The key thing is their attitude once you mention it. Do they seem keen? Are they taking you seriously? 4. What are the areas you’re trying to develop right now? Ofsted like to see that schools know where their weaknesses are, and are taking steps to improve them. You should be interested in this too. You want to know that the school your child might attend has a great attitude to learning – and that’s not just pupil learning, but staff learning. If they’re not actively trying to improve specific areas (and able to tell you them at the drop of a hat), then what exactly are they doing? Remember: the perfect school doesn’t exist! Instead, look for one which is ‘on the up’. 5. How do you deal with behaviour in the classroom? Again, a school doesn’t need to be perfect, but what you’re after here is some kind of guarantee that they work with their children on improving behaviour. 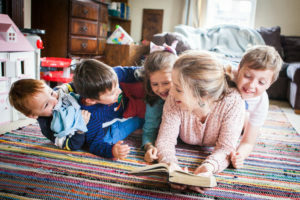 All children – but looked-after children especially – will get much more out of an approach which helps them to self-regulate their behaviour and make better decisions in the future. These questions aren’t an exam! Please don’t disregard schools which don’t score highly on each question. All good schools are in a process of improving – you’re simply trying to find out which ones will be flexible to the needs of your child (and are aware that your child will have needs specific to his/her looked-after background). Good luck as you look! And for weekly doses of all things parenting/family/adoption/faith/chocolate, I’d love you to join the Desertmum community! I’ll even send you Ten Survival Tips for Newly Adoptive Parents as a thank-you. Great post, and yes the 3 years thing did stand out to me too! Yikes!